British gymnastics has had its best Olympics. And it happened in TV prime time. When GB's men won team bronze, their finest result in a century, there were no gold medals on the board for any British athlete. The gymnasts had a clear run at a huge early-evening television audience as the success story of the Games up to that point. Already, anecdotal evidence suggests clubs around the country are being inundated. The team spent 24 hours conducting countless TV interviews, promoting their sport to a Games-gripped nation. 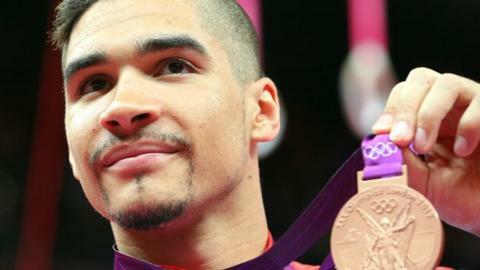 Add to that a silver medal for Louis Smith, plus bronze for both Beth Tweddle and Max Whitlock, and GB's gymnastics haul of four medals is double the target set by funding body UK Sport. Now comes the hard part: doing something with that momentum. How can a sport like gymnastics set itself up for the next four years on the back of this success? "I'm not going to shy away from the fact that both Louis and Beth were in the frame for gold, but the reality is Louis has not yet won a major international gold medal. That was more a case of media expectation than absolute reality. "As far as Beth's concerned, over the last two years in particular, even getting Beth to the starting line looked a huge challenge. "In April, a training session revealed a problem that needed an operation and suddenly everybody's staring into the abyss - thinking this may not happen at all. "I'm proud of the way she's conducted herself and she got her just desserts with a medal." "The team bronze was a momentous achievement but it was also at just the right moment in time," says Tim Jones, performance director for British Gymnastics. "It came about on a day when results elsewhere for Team GB weren't quite what people thought they would be. It was a quiet day. The competition took place around tea-time with a big audience on TV, and to pick up that medal was historic. "We could have never planned for that, but we got some great publicity from it. It's really catapulted the sport forwards." To maximise the benefits of this exposure, British Gymnastics has to find a way to cope with the unprecedented interest and channel it into the top end of the sport. In practice, that means more places to do gymnastics and more people to nurture the best talent. "If we can coach full-time, then the gymnasts can work full-time and there's only one way to go, and that's forwards," says Amanda Reddin. As Tweddle's coach, she has spent more than a decade masterminding her success on the international stage. "Funding has looked after us and done the job, if there's more funding then maybe we can do a better job." Changing the way coaches in the UK work with their gymnasts has been central to the improvements we now see at the top level. Coaches are given "ownership" of gymnasts throughout their careers - if you take a young hopeful and turn them into a superstar, you stick with them for the journey. Jones promises money and effort will go into finding more coaches and making them better ahead of Rio 2016. "The interest in clubs has been huge over the past few weeks, that's our bread and butter in terms of paying the bills," he says. "We're a membership-based sport and we rely on a lot of young kids being inspired by the likes of Louis, Max, the boys' team and Beth. "One of the biggest challenges will be that clubs need to ensure they have the capacity. We can work with clubs to build the workforce to take that next generation forwards." Reddin, who will soon lose Tweddle to retirement, will have discussions over a new role within gymnastics in the months to come. Adrian Stan, Britain's technical director, will take on a post dedicated to helping coaches get the skills they need to raise champions and manage their gymnasts in high-pressure environments. Who will be in the team for Rio 2016, then? Certainly not Tweddle, who steps down aged 27, while Smith - though only 23 - says he may be forced out by younger talent. Rebecca Tunney's development may be interesting to watch. The youngest member of Britain's Olympic team at the age of 15, she made an assured debut in the team and all-around finals and appeared unfazed by competition at the highest level. For the men, Whitlock and Oldham will be the senior hands by 2016 having been blooded here. Behind them, a host of juniors are battling for position. Frank Baines and Nile Wilson were first and second respectively at May's European Junior Championships and helped their team to a third consecutive European gold. Gymnastics has a turnover rate so high that guessing the Rio line-up is impossible. Daniel Keatings won a world silver medal in 2009 and European gold in 2010 but was nowhere to be found at London 2012, so nothing is taken for granted. "The challenge of each Games is that everybody works so hard for something you have to produce at a given time in a given year," says Jones. "To come away this time having no regrets, with the sport in the spotlight, is fabulous. But things could have been even better for us here. We've missed out on a gold medal with Louis and lost a silver medal in the team after an appeal. We've not had a huge amount of luck on our side, we've worked hard for everything we've got. "Now, hopefully we'll have a whole new generation of people to take on board. We have to make sure our coaches have all the skills at their fingertips to cope and maximise results."